One of the first reported massive bowel resection was in 1880 when Koeberle described the resection of more than 200 cm of small bowel in a patient that in the end survived (Koeberle E. Bull Acad Med 8:249–50, 1881). In the late 1960s, parenteral nutrition (PN) became available having a tremendous impact in the management and outcome of patients with short bowel syndrome (SBS). Once PN support was better developed in the 1970s, the field moved toward delivering PN at home. Soon, hospitals developed home PN programs to decrease expenses and allow patients to return home. Over the past decade, lengthening procedures (Kim et al. J Pediatr Surg 38(3):425–429, 2003; Sudan et al. Ann Surg 246(4):593–601, 2007; Mercer et al. J Pediatr 164(1):93–98, 2014), techniques to decrease central venous catheter (CVC)-related sepsis such as ethanol lock (Cober et al. JPEN J Parenter Enteral Nutr 35(1):67–73, 2011), and the use of different lipid emulsions like omega-3 fatty acids (Diamond et al. J Pediatr Gastroenterol Nutr 48(2):209–215, 2009) and lipid minimization strategies (El Kasmi et al. 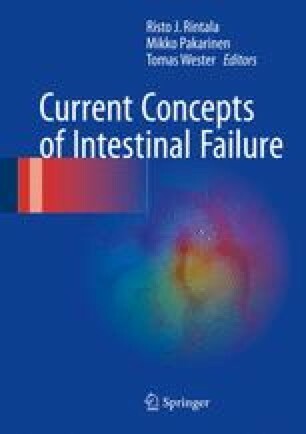 Sci Transl Med 5(206):137–160, 2013) have emerged as modalities that have impacted the overall outcome of intestinal failure and long-term PN use. All this has led to more comprehensive programs to manage children with intestinal failure known as intestinal rehabilitation programs. These programs usually have different professional disciplines, such as pediatric gastroenterologists, surgeons, dietitians, nurses, social workers, psychologist, feeding therapists, etc., organized as a multidisciplinary team to address the complexity of these children. These intestinal rehabilitation programs have had a major impact in overall outcome, more so, over the past decade. I discussed general concepts that would lead to a successful and modern intestinal rehabilitation program.